In a recent New York Times opinion column, “Need a Job? Invent It,” Thomas Friedman writes, “My generation had it easy. We got to “find” a job. But, more than ever, our kids will have to “invent” a job.” Statistics of slowing job growth bear this out and entrepreneurial endeavors are the go-to options. 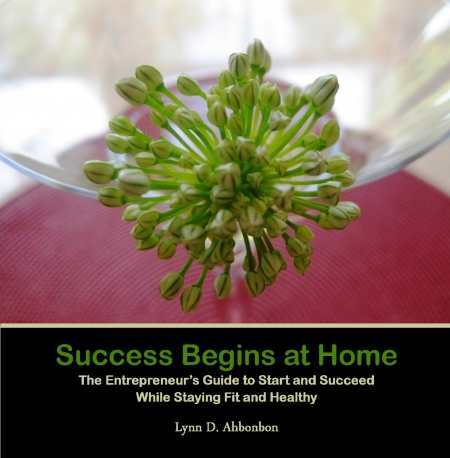 Lynn D. Ahbonbon’s Success Begins at Home is a comprehensive and easy-to-read guide for business start-ups. The book is divided into three sections: Entrepreneurship, Healthy Living, and Food Made at Home. Despite a short eighty pages, the reader may be better served by two separate books as all sections require commitment and follow through, whether it is tracking expenses, tracking calories, or learning how to cook better and healthier. Tackling a new business and one’s health simultaneously is a daunting task despite the beneficial outcome. Ahbonbon believes that entrepreneurs, to be truly successful, should, “align their business goals with their personal goals.” Her mission is the combination of a healthy mind (through the steps in section one) and healthy body (through the dietary and exercise recommendations in sections two and three) as the key to success. The Healthy Living section includes easy-on-the-eye charts about daily calorie intake, physical activity guidelines, and handy metric conversions. Tips about Super Foods, food labeling, fat facts, organic options, and food safety are brief and clear. Ahbonbon writes about using silverware spoons vs. measuring spoons and informs readers, “if you use a silverware spoon, it is important to discard the excess by running your finger across the top.” Handy indeed. Food Made at Home is the final section of the book and features recipes (with photographs) that are ranked by ease of cooking, prep time, cooking time, and number of servings. Recipes from soup to nuts, as the saying goes, include global selections such as falafel, Hawaiian bread, pizza, spicy noodle soup with clams, and an ultra rich looking chocolate cake with rum. Additional recipes are available on the author’s website at www.ahbonbon.com. First-time entrepreneurs as well as old hands will benefit from Success Begins at Home by taking the headings and subheadings in the Entrepreneurship section and turning them into a checklist. A well-planned and researched start-up process emerges and there’s little room for failure. Ahbonbon was raised in various countries and cultures, including the United States, Europe, and Asia, and credits this upbringing with her interest in healthy eating. She graduated from the University of Southern California with a B.S. and MBA, and held several positions at a large automotive corporation before taking the plunge into self-employment. She has been the president of a nonprofit corporation for fifteen years, providing education in entrepreneurship to small businesses.